Our twin battery T67 IR LED illuminator is a great addition to your night vision setup. The T67 IR is fitted with the latest Osram OSLON Black Series 850nm IR double stack emitter. The beam is focussed via a precision 67mm aspherical lens and is easily and smoothly adjusted from flood to a very tight spot for very long range illumination. Note: We modify the IR pill in our T67 to remove the considerable light spill that is evident in the standard versions of these illuminators. 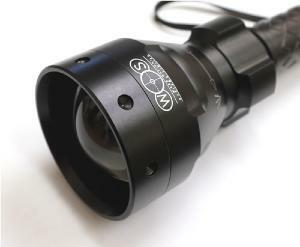 On a rifle mounted application this light spill can reflect back from the barrel or moderator severely reducing the performance of the night vision system. Awesome !! Tried it out with the video camera in total darkness, just amazing !! Thanks. Sehr gute, robuste Lampe. Auch für die 0. Gen. gut. Eine sehr gute Lampe, auch für die O Gen. ( FERO 51). Only received the ward T67 ir illuminator today. Tried it out along with the ward700 nightvision and clive has got it spot on. ( works perfect.) Only downfall is it can be slightly on the heavy side but then i use a tripod Thanks Clive. Exellent product from a top supplier,dealt with them before no problems. recommendet to order also the clamp to connect the T67 to a scope, otherwise the handling is difficult. I am not shure if the clamp is high enough because the diameter of the T67 is very big and hopefully it will not collide with the scope. The brightness is superb and enables the cam to deliver a crisp picture, Regards from germany.